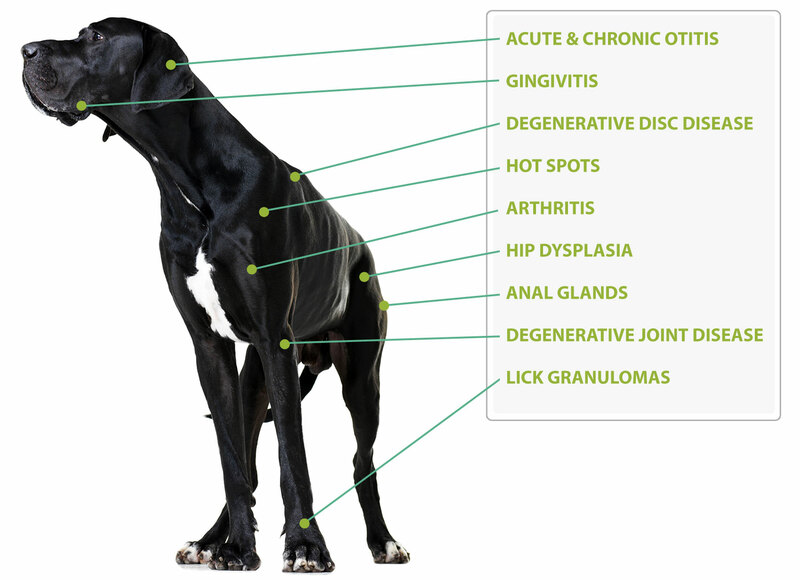 Your pet may be a candidate for laser therapy if tests reveal degenerative disc disease and arthritis in several joints. Veterinarians are using laser therapy increasingly these days to give pets a new lease on life. Approved by the Food and Drug Administration in 2002, laser therapy uses infrared light to promote healing and reduce pain and swelling in areas affected by arthritis, trauma, surgery and infections. Because it’s noninvasive and has minimal side effects, laser therapy is popular among pet owners, too. But that’s not all. Most of the time, it’s quick, painless and not too pricey either. During treatment, we apply a laser light to the diseased or injured area with a wand, careful to keep the laser moving. That’s when the “magic” happens. Laser stimulates activity within cells to nourish them and remove toxins and waste. Inflammation and pain decrease and blood flow increases to help the tissue repair more quickly. Laser therapy allows your pet to regain mobility and strength at a much faster rate than other treatments by eliminating pain and reducing inflammation. 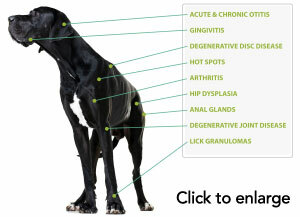 This is especially beneficial for animals recovering from surgery or injury and for older pets depressed by inactivity. Laser therapy also helps to release endorphins. These are an animal’s natural painkillers. They reduce stress and anxiety, relax muscles and elevate your pet’s mood.